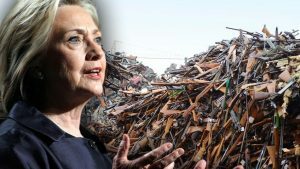 Clinton’s First Executive Order As President Discovered Via Undercover Video – GUN CONTROL!? Every now and then I am amazed by the foresight and wisdom of our Founding Fathers. How could they have known how desperately we would need our Constitution and Bill of Rights? Specifically the second amendment, we need it! And with Secretary of State Hillary Clinton, as a very real possibility for our next president, we have never needed it more. Hillary Clinton has never hidden her distaste for guns and the Second Amendment. And now there is a very real fear that her potential presidency will be focused on taking that away from us. Will her first executive order be focused on taking away our guns? Sounds a little terrifying doesn’t it?? And it looks like that might be her plan. I was a little skeptical. Republicans have Congress, right? Well, after watching this video I was a little more nervous. A group of conservative journalists infiltrated a liberal gathering. And what they heard gave me chills. And yes, talk of a presidential executive order was discussed. If they can’t flip Congress, they will just go through them to take away ammunition and handguns. You can hear a woman incredulously asking why anyone would ever need a hand gun. She begrudgingly accepts hunting guns as a part of some people’s lives, but only if used for hunting. Then she asks why anyone would ever need any other type of gun. All I can really say to that is this… I hope she never finds out what they might be needed for. What will you do if this happens? Hillary will try to take our guns. I guess the only real question is this. How far is she wiling to go? And what are we willing to do to prevent the government from taking away our constitutional rights?